Sneakers are a hot commodity in the fashion industry. “Hypebeasts”, “sneakerheads” and “resellers” have become a global phenomenon, and we’ve witnessed guys queue up for days at a time and even selling their own grandmothers for the latest, hottest and most elusive kicks to hit the market. Although the resale market for limited editions (read: Yeezys) has quickly gotten out of hand, the most expensive pair of sneakers ever purchased were the basketball shoes worn by Michael Jordan during his legendary “Flu Game”, which went for a record $104,000. It just goes to show that the power and grip that this casual shoe has over certain people (us included). Sneakers are now the go-to footwear choice for style-conscious men globally. Whether you choose to wear yours with a lounge suit or throw them on with your favourite jeans, these are the 5 types you should have in your collection. An all-time classic that will never go out of style. The white sneaker’s sleek appearance and unassuming nature allows them to be dressed up or down for any occasion, allowing the wearer to play around with their look without fear. When it comes to purchasing, keep it simple. A high-quality leather upper with minimal detailing and subtle branding is what you’re after – loud patterns or extraneous detailing will only serve to hamper their versatility. Common Projects’ Achilles Low is the pinnacle in this sector, but those on a budget should look no further than Adidas’ timeless Stan Smith design. Styling wise, try teaming a pair of white sneakers with straight-fit black trousers and a simple white T-shirt for an easy, everyday ensemble. Elevate your look by tucking your tee into your waistband and ensuring your trousers finish at or just above the ankle. This will not only show off your box-fresh kicks properly, but also serve to create a contemporary, streamlined silhouette. If you want, you can swap out the trousers for your favourite denim – this time, cuff or pinroll the jeans for a cleaner finish. For the more adventurous of you out there, why not try wearing your classic white sneakers with a suit? Thanks to menswear’s continued relaxation, traditional style “rules” no longer apply. Some of the best-dressed men on the planet are now playing with the idea of formality, dressing down their tailoring to remove the stuffiness from it. To pull it off, switch your shirt for a tee or polo and pick a suit that’s relaxed in nature (think unstructured materials, slightly looser fits and bolder colours or patterns) so your choice of casual kicks don’t jar. The slip-on sneaker has shook off its scruffy, prepubescent connotations to become a firm fixture within the wardrobes of stylish men across the globe, thanks in no small part to the rise of streetwear and the pilfering of skate culture by luxury designers across the globe. The go-to brand for this shoe would of course be the original, Vans. 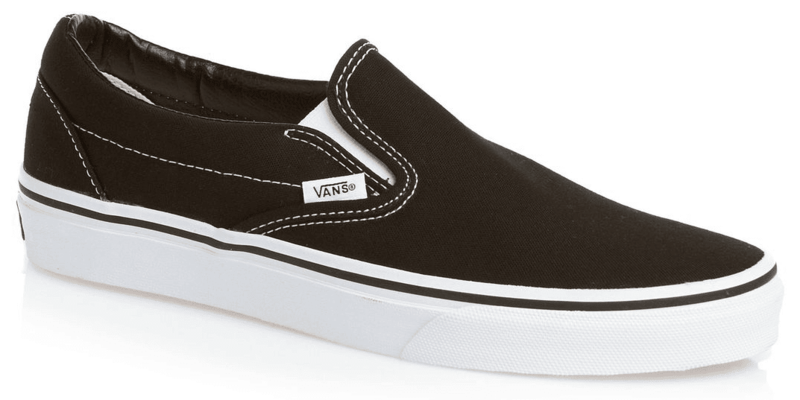 The Vans Slip-On silhouette is a hall-of-fame shoe that has spawned thousands of imitations and has the ability to work with plethora of different looks and styles. Take a classic black pair with a contrast white sole and team them with some rough-and-ready work pants (think Dickies 872) or jeans (Levi’s 501s) in a lighter hue to reference their skate heritage. Then, throw on a plain T-shirt and an overshirt or chore jacket and you’ve got the making of a easy, stylish and practical outfit that will carry you through three seasons of the year. Alternatively, take the slip-on sneaker to the next level by opting for one of the many luxury versions on the market currently. 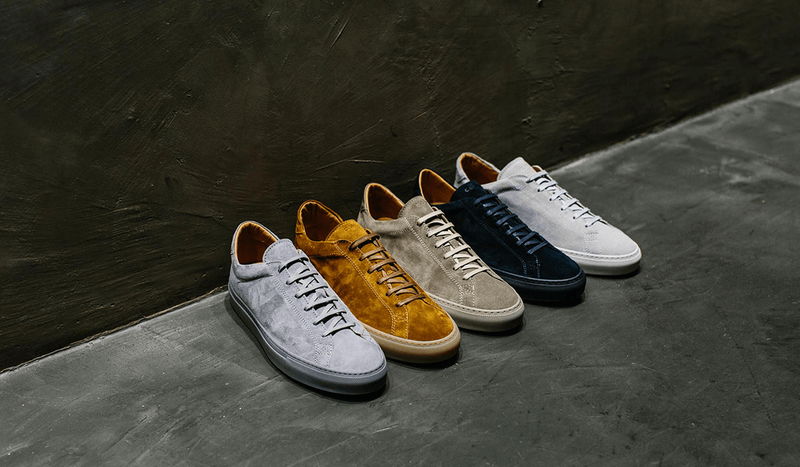 Brands from Lanvin to Tod’s are producing slip-ons in premium materials such as suede and leather, which will instantly upgrade any smart casual look. Combine with tailored trousers, an Oxford shirt and an overcoat for a high-low look that is effortlessly sophisticated. The high-top sneaker has never really fell out of style since the late 1950s, when timeless icons such as Elvis Presley and Steve McQueen cemented their place within the menswear pantheon. 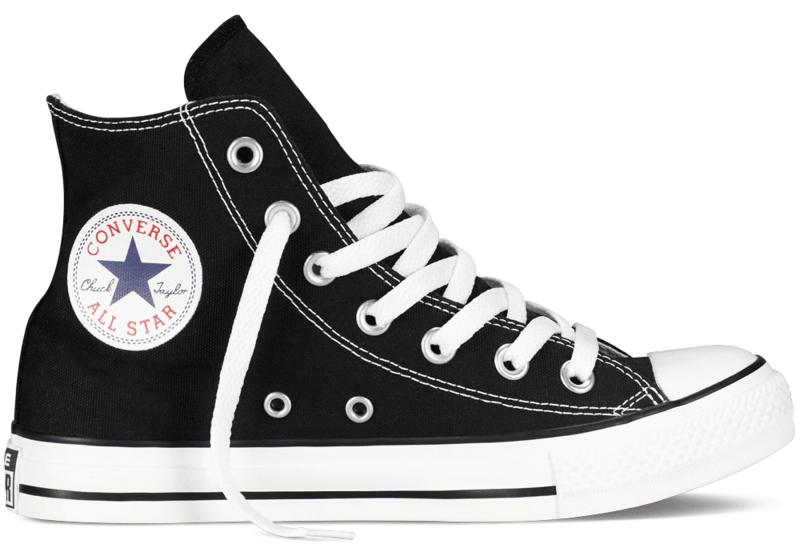 Although the high-top comes in many forms, the most famous and iconic design is Converse’s Chuck Taylor All-Star. Though initially created as a basketball shoe for its namesake, Charles Hollis “Chuck” Taylor, it quickly went mainstream thanks to its perfect mix of comfort, simplicity and style. Now over 100 years old, it’s claimed that Converse still sells over 200,000 pairs of “Chucks” a day, making it one of the most successful sneaker designs in history. With nearly every man having owned a pair of Chuck Taylors as some point in their life, the primary issue here is separating yourself from the crowd. So, rather than jeans, why not elevate this classic sneaker by combining them with black, straight-leg trousers? Throw over a casual shirt (short- or long-sleeved, plain or patterned) and you have a look that’s perfect for day or night. Designer spins on the high-top sneaker tend to be even more minimal than Converse’s take, often shunning any form of branding (perhaps counterintuitively) and letting the luxe nature of the shoe take centre stage. The likes of Saint Laurent, Common Projects and Maison Margiela are producing a variety of neutral, earthy versions in grained leather and buttery-soft suede that would be perfect for teaming with everything from slim-fitting chinos to tailored separates. The majority of men continue to shy away from any piece that might make a “statement”, for fear of looking too outlandish and be stricken with ridicule down the local pub. But times have changed and we’re here to reassure you that you can pull off statement sneakers with confidence. Firstly, to clarify: when we say “statement”, we don’t mean those horrendous, multicoloured high-top atrocities complete with stuffed pandas and poodles stuck on them (we’re looking at you, Mark McNairy). No, all we mean is a design featuring a slightly bolder hue, a subtle pattern or motif, or a chunkier silhouette. Just remember that – as with any garment that is designed to stand out – you should keep the surrounding pieces fairly simple so they aren’t all competing for attention. Pink, green, rich blues (teal, cobalt, petrol), burgundy and earth tones all make great choices when it comes to branching out from the safety of neutrals, and all look great anchored with black, indigo and grey legwear – whether you prefer jeans, trousers or chinos. 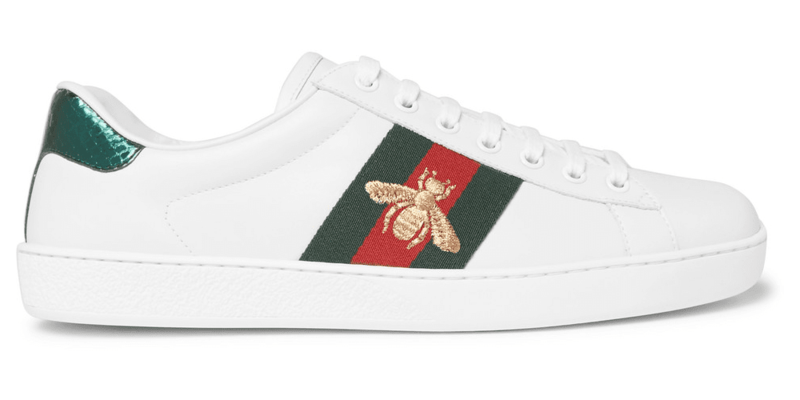 Everyone from Nike and Adidas to Gucci and Balenciaga produce statement sneakers for men, meaning there’s something for every budget, so have a look and play around with different patterns and colours to see what works for you. Sportswear and style have long been teammates, with global brands such as Nike and Adidas having infiltrated their way into mainstream fashion on the back of lucrative designer collaborations and sponsorship of high-profile athletes. But it’s not just elite sports stars that need their clothing to perform anymore. Today, the modern man wants his wardrobe to work harder for him, both in and outside the gym, which has given rise to sneakers that are designed to perform, but are still stylish enough to be worn everyday. No-one wants to wear their smelly gym shoes with their best clobber, so it’s wise to invest in a stylish pair of athletic trainers for those days where comfort is the priority. 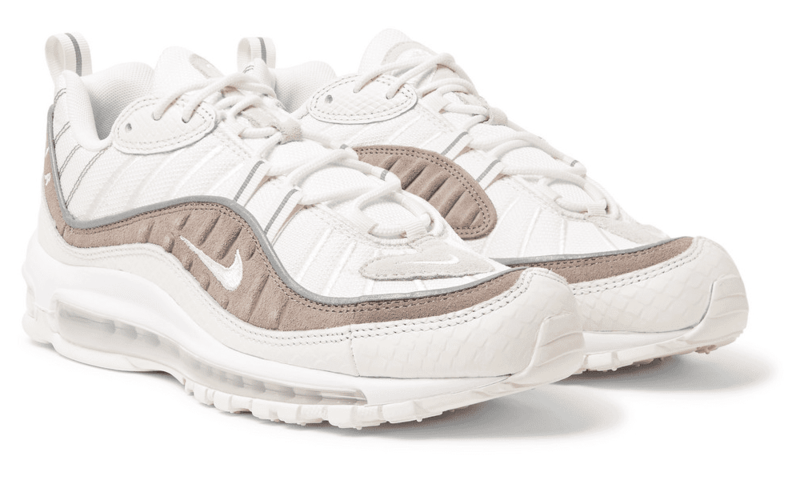 The Nike Air Max 98 is perhaps the best contemporary example in this sector. At launch back in 1998, it was touted as Nike’s best running shoe ever, and today its inimitable air sole unit offers everyday comfort while its retro design has sneakerheads and industry insiders alike clamouring to get their hands on the recently re-released model. Other excellent examples within the athleisure sector include New Balance’s 574, Adidas’ Ultraboost and NMD, Nike’s Lunar Epic and Free Run, and Asics’ Gel-Lyte. It’s important to counteract the inherently casual and athletic nature of this sneaker by dressing them up slightly. Team them with a pair of navy trousers or jeans in a wide/straight leg and a simple white polo shirt. If the weather is a bit cooler then you can throw on bomber or suede jacket for added ballast.